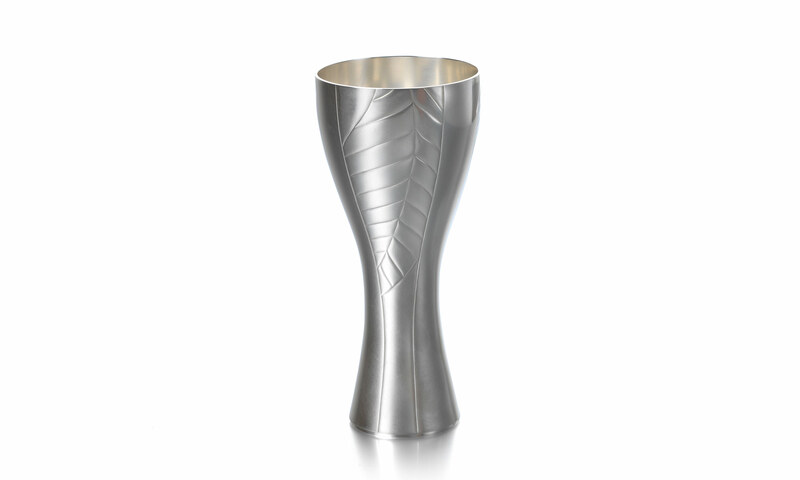 As a member of the Court of Assistants, the Company’s governing body, court members are invited to commission a contemporary silver cup for use at Goldsmiths’ Hall dinners. Each cup is unique and holds dual ‘personality’, reflecting the interest and character of the patron, combined with the silversmith’s style and expression. Our most recent commission was that of Court Member, Michael Prideaux. Michael approached Goldsmiths’ Fair regular, Angela Cork, with his ideas and inspirations and she turned them into silver. Angela started by researching and collecting imagery from visiting the Prideaux’s house and garden. Together, Michael and Angela they agreed that she would express certain ‘chapters’ of his life story in separate panels around the cup. The cup’s three external panels each have a fascinating connection to Michael: the rhododendron leaf reflects the importance of the garden and Michael’s interest in horticulture, the tobacco leaf symbolises the history of the Prideaux family’s involvement in the tobacco industry, and the final panel, the detail of Michael’s front door, portrays an opening into his private dwelling. Angela said that she was compelled to choose the carved details of the door as they also emulated the repeating patterns of the leaves. Michel’s cup is a great example of the original purpose of the Court Cup commissions, echoing the personalities of both the owner and the maker and providing ambassadors for living craftsmen.